Tiffani Theissen and Barry Gibb don't have anything in common (to the best of my knowledge) outside of the fact that I recently seen a photo of each of them wearing a hat of a professional baseball team. That's about all it takes for me to want to make a card. I didn't have a year of significance for either picture so I used two templates that I just thought would compliment the picture. 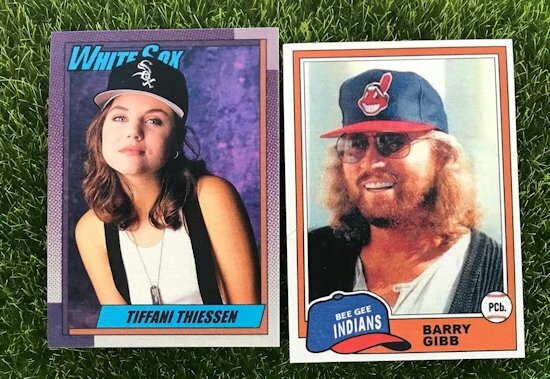 Tiffani Theissen White Sox with the 1990 Topps baseball inspired design and Barry Gibb Indians with the 1981 Topps.